Smartron has unveiled its new budget smartphone dubbed as tphone P in India. Let’s check out the specifications of this smartphone. Smartron tphone P features a 5.2-inch HD 2.5D curved glass display with a resolution of 1280 x 720 pixels. The device is powered by 1.4GHz Octa-Core Snapdragon 435 processor, Adreno 505, 3GB RAM and 32GB of onboard storage. The storage is expandable up to 128GB using microSD. Out of the box, the phone runs on the slightly older Android 7.1.1 Nougat OS. Coming to the camera segment, it sports a 13MP rear camera which comes with LED Flash, f/2.2 aperture, 1.12um pixel, PDAF. While on the front there is 5MP selfie camera with f/2.2 aperture. The device sips its juice from a massive 5000mAh battery. It can also power other devices through OTG. tphone P is a hybrid dual SIM compatible phone and it arrives with 4G VoLTE, WiFi 802.11 b/g/n, Bluetooth 4.1 and GPS connectivities. Additionally, it also has a fingerprint scanner placed at the back of the device which can unlock the device pretty fast. 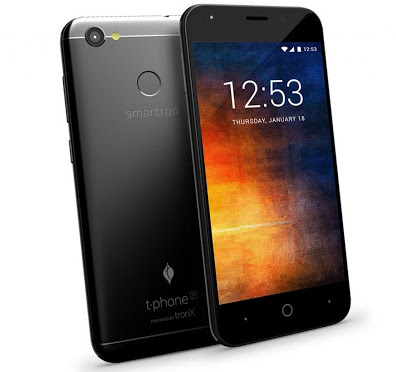 Smartron tphone P comes with a price tag of Rs. 7,999. The device will be exclusively available for purchases on Flipkart starting from January 17th. The phone comes in Black color.